The $750,000,000 funding for the health of the workers at the World Trade center site that I worked to get was just renewed for 5 more years. Pesent Consultant to the CA Department of Justice on the cleanup of the Exide battery recycling plant in Los Angeles. NSF program collecting and analyzing measuring aerosols on the Greenland Summit site, started in 2003, and renewed into 2021, with Dr. Nick Spade, co PI. The purpose of the work is twofold: 1) understanding the dust levels present at the times dust appears in the Greenland cores, especially around the Younger Dryas ice age, and 2) evaluating the impact of transported anthropogenic aerosols into the Arctic on the Arctic climate. Contracts (3) with US EPA on aerosols and highways in Detroit and Cleveland. Three new science fiction books rich in accurate science, following an asteroid strike on the Earth with only 3 days warning: “Ark Asteroid Impact”, “Ark: Diaspora”, and “Ark: Return to Eden”. 2008 – 2014 Appointed member of the CA Inspection and Maintenance Review Committee (IMRC) overseeing Smog Check II. Rachel DuBose leaves the DELTA Group for her new job at the Sacramento Metropolitan Air Quality Management District. Good luck Rachel! (26.7.2005) The American Lung Association of Sacramento-Emigrant Trails Health Effects Task Force publishes "Sacramento Interstate-5 Aerosol Transect Study" (Watt Avenue Particulate Study/Tailpipe Pollution). 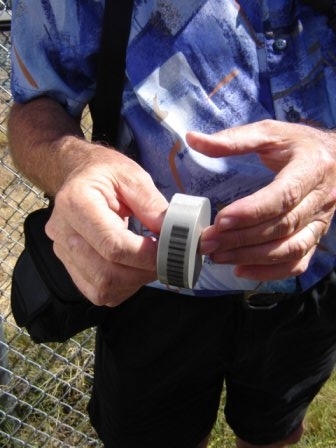 (26.7.2005) The Sacramento Bee publishes "Alert on tailpipe smoke: Big pollution source falls under radar, experts say" based on Dr. Cahill's studies of particulate pollution in the Sacramento region. Cahill, Thomas A.; Cliff, Steven S.; Portnoff, Lee; Perry, Kevin D.; The DELTA Group; American Lung Association of Sacramento-Emigrant Trails; "Sacramento Interstate-5 Aerosol Transect Study". July 2005.